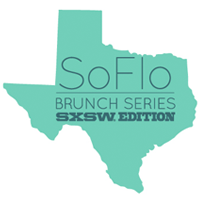 With plans to take the SoFlo Brunch Series on the road, Austin was the first stop! This was a meet-up to introduce the brunch and the creative platform to SXSW- goers. I was excited for Jason Francis, the Social Media Samurai to join the event as a co-speaker and share his experience as a blogger and online influencer in tech, travel, and social media! How Influence is seen as the new currency online. In addition to the presentation, I was able to connect with movers that is making noise in the digital, mobile, and philanthropic world. Check out the pictures under the previous events tab. Jason Francis, SXSW, Driskell Hotel, and the attendees that joined us for the meet-up. After this week, I'm thinking of the next stop for the SoFlo Brunch Series. If you are interested in collaborating in South Florida or another city, contact: donnet@nuglomarketing.com. The SoFlo Brunch Series aims to empower and connect a dynamic group of professionals and entrepreneurs in various industries by sparking in-depth conversations in Miami, FL.